a game that you’d play. who played with them last? Lovely. Having just spent a Christmas with my 2 year old grandson and seen all his modern toys I am old enough to feel nostalgic for the carved wooden train and the rattle! I know what you mean! 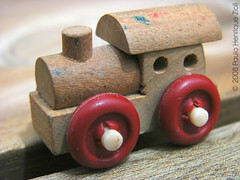 I don’t think the wooden train I found had plastic wheels, I’m sure they were wooden! The rattle was one from a string of pram rattles – I doubt you can even get those nowadays! What a lovely wooden train. My son is in love with his wooden trains. He plays with them every day. Yes it looks quite old, probably from the 1970’s. I always wanted a train set!